The Bug & Bee House in it's new gift packaging provides a home for solitary bees, ladybirds and other beneficial insects such as lacewings. 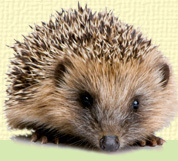 These invertebrates provide the vital role of pollination in your garden or are great at predator control, munching through aphids and the like. 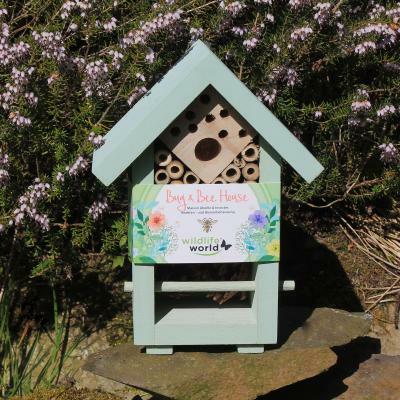 The Bug and Bee House is manufactured from durable natural FSC timber, and painted in an attractive soft green water based paint. The bee & bug house can be hung from the D-hook on the rear or placed firmly on a wall or ledge. The ideal height is between ground level and about 1.5m, preferably facing south east. This provides a warm position with some morning sun which helps with the emergence of solitary bees in the Springtime. The instructions for siting your bug and bee house are on the inside of the decorative wrap around band. The bee and bug house not only looks good in any garden and provides but makes the perfect gift for gardeners and nature-lovers alike.